EL34s deliver 60W of awesome tube power through 2 high-quality Celestion speakers in this nicely priced boutique combo. 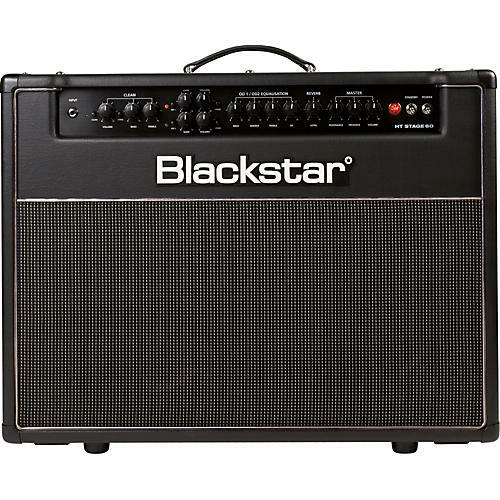 The Blackstar HT Stage 60's selected duet of EL34s deliver 60W of glorious tube power through 2 high-quality Celestion speakers, making for a combo that will deliver every night, even in the most testing live environment. The Blackstar amp's 'boutique' style clean channel is extremely versatile with 2 modes: 'British Class-A' and 'dynamic US'. Each of the amplifier's 2 ISF (Infinite Shape Feature) equipped overdrive channels allows a further 2 modes. The Clean Channel on the Blackstar HT-60 combo has 2 modes, 'boutique' and 'modern' and its own Tone control provides a wide range of clean tones. The Voice switch reconfigures both the preamplifier voicing and gain structure, and the power amplifier damping, to reproduce either ringing Class A Performance in the 'boutique' mode, or very clean and tight Class AB tones in the 'modern' setting. The Overdrive Channel has its own EQ section and a Voice switch that allows the character of the channel to be changed, providing a wide variety of overdriven tones. The channel is characterized by a tone that's high in gain, but lacks any of the detached top-end 'fizz' often found in similar designs. This is a result of the Blackstar HT-60 guitar amp's unique preamplifier and power amplifier shaping techniques, which cleans up the overdrive beautifully as the guitar volume is reduced. Even at the most extreme settings, the overdrive channel on the Blackstar Venue HT-60 amplifier remains natural sounding. The ISF control is unique to Blackstar Amplification and represents a major step forward in tone shaping flexibility. The ISF control shifts the response of the 3-control tone stack between a US-type response at one end, and at the other a UK-type response. The Blackstar tube amp provides an infinite number of alternative tone choices in between the 2 extremes that would be otherwise unavailable. The Blackstar HT-60 guitar amp also features a completely natural sounding digital reverb, which is outstandingly musical on both clean and crunch tones and raises the benchmark for guitar amplifier specific reverb design. A Dark/Bright switch allows the overall reverb characteristics to be modified to suit different tastes and playing styles.